The Nation’s new Surgeon General appears to have been selected. He has been told that wellness, fitness and obesity will be the top priorities for the next four years, according to CNN. Nothing better illustrates the wisdom of politicians making healthcare decisions on our behalf than this appointment. He not only serves on numerous federal boards and governing bodies that establish public health policies, he also advances the priorities for research. The Surgeon General also oversees the Commissioned Corps of the U.S. Public Health Service, one of the federal government’s seven uniformed services [which explains the uniform]. We mustn’t overlook that the Surgeon General may be given a larger role in the upcoming administration, as a new health corps is being envisioned that will enlist nurses and other healthcare professionals, retired and active, in national service to spread the “preventive health message” of the Surgeon General. Health corps workers will spread out in community-based efforts focused on making sure citizens eat and follow the requisite healthy lifestyle and preventive wellness screenings, medications and weight loss recommended by the Surgeon General. The Surgeon General serves as role model, to “elevate the quality of public health practice in the professional disciplines." With this job description in mind, neurosurgeon Dr. Sanjay Gupta, M.D., was chosen. The movement to reform our healthcare system, led by the integrative medicine movement using the motto “Wellness care, not disease care,” appears to have made inroads. This maxim follows the belief that most chronic diseases of aging are preventable and caused by bad foods and lifestyles. Under this public health modality*, preventive wellness should be prioritized over medical care. Wellness sounds so good, wholesome and harmless. Who doesn’t want to believe that by eating and living right, we can attain optimal wellness and prevent all of the diseases of aging… and even live to be a 100? In this, Dr. Gupta is renowned. He revealed the secrets of living to 100 in his anti-aging book, Chasing Life — New Discoveries in the Search for Immortality to Help You Age Less Today. His quest for immortality led him to seek answers for not only slowing down the aging process, but actually reversing it. As Life Extension Magazine reported, his book covers everything from cryonics, genomics and neutraceuticals, resveratrol and hormone supplements in his search for biological immortality. “I think in the next couple of decades, we’re going to get to a point of practical immortality,” Dr. Gupta told readers. He also promotes mind-body healing. The role of attitude and optimism has a role in living longer, he said. He follows the Japanese ikigai, where one meditates and focuses on your purpose on this earth every morning. As covered earlier, in Chasing Life he promises we can add 30 years to our lives by following his simple prescriptions. Dr. Gupta says we can add 2 years to our lives just by eating almonds and another 3 years eating fish! Cut fast food, he says, to add 4 years (the fat, cholesterol and the pounds are just bad) and another 6 months by cutting caffeine. And “always be a little hungry.” Daily flossing adds another year to our lifespan, he promises. 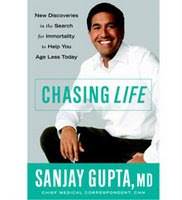 Dr. Gupta’s book joins the $50 Billion a year anti-aging and ‘wellness’ industry. The American Academy of Anti-aging Medicine conventions are filled with booths advertising vitamins, hormones and pharmaceutical drugs, oxygenating and detoxifying and other modalities promising optimal wellness and enhanced energy, according to the New York Times. As covered here in depth, anti-aging and preventive wellness is not recognized by mainstream medicine as a legitimate field and it isn’t scientifically-based, explained Dr. Robert N. Butler, M.D., a gerontologist and founder of the International Longevity Center. BCC Research, a market research company in Wellesley, Massachusetts, expects this industry to reach $71 billion this year. Those may be underestimates now that Dr. Gupta has been selected for the new Surgeon General to promote the new administration’s “wellness not disease care” agenda under the newly appointed Secretary of Health and Human Services, Tom Daschle. 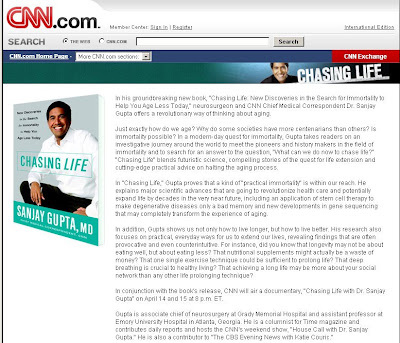 Besides his “revolutionary way of thinking about aging” in his book promoted through CNN, Dr. Gupta has been CNN’s medical correspondent and featured on its “New Your Resolution” and “Fit Nation” health specials and his weekend show, “House Call with Dr. Sanjay Gupta.” He’s also a fitness columnist for Time Magazine, and contributor to CBS health segments. According to the WSJ, he was a logical pick as a TV talking head. But he also has a visible role as a public speaker, available for a $35,000-$50,000 fee (travel costs from Georgia are extra). Through his public speaking, we’ve learned more about what we can anticipate as the nation’s health educator. One of his keynote talks is “Obesity in America,” which was part of his “Fit Nation” tour of the country. It focuses on childhood obesity. The biggest threat to the nation, he says, is the epidemic of childhood obesity and now type 2 diabetes among kids which is a “direct reflection of the childhood obesity problem.” In stressing the imperative of addressing child obesity through school nutrition and community interventions, to university students in Michigan and LE Magazine, he repeated the popular myth that kids today may be the first generation to live shorter lives than their parents. “I think that society as a whole has to make a real commitment to solving this [obesity] problem,” he told LE Magazine. In Time Magazine, Dr. Gupta wrote that doctors have to tell patients they are obese and need to lose weight. “Show a little courage and say what needs to be said — even if it hurts a bit,” he said. As the Business & Media Institute reported, he supports widespread government interventions, including fat taxes on behalf of the war on obesity, a tax on sodas and zoning laws to ban new fast food restaurants. As Dr. Gupta has told reporters, he wants to test every American for heart disease, stroke and cancer — which will require the will of the federal government, insurance companies and the public — and put everyone on a prevention track. He supports calcium scores and CT angiograms and medications so, he said, no one ever need have a heart attack, stroke or cancer again. It is hard to know which is more frightening: that the government — which will decide what medical care we can receive, what clinical guidelines our doctors must follow, what research is funded, and where limited healthcare resources will be spent — selected this doctor to represent the best scientific information available on health. Or, that only one in ten consumers polled at WSJ saw a problem with this selection. * As we’ve seen, this rendition of public health has nothing to do with proven preventive public health measures, such as vaccines, preventive dentistry, safe drinking water, and ensuring the poor have enough to eat. These aren’t about bringing needed medical care, addressing disparities in healthcare, reducing healthcare spending, or addressing the shortage of doctors and nurses.